Now that Christmas has passed I can finally show ya’ll the gifts that I made for my family this year! Frugal gifts are the best kind of gifts to give, but no one likes a random cheap gift. 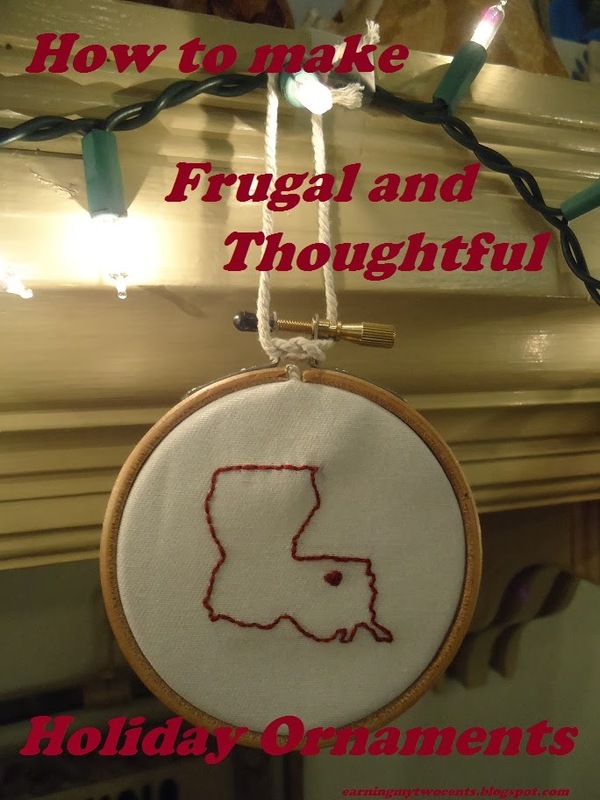 Giving frugal and thoughtful gifts hits the right stride so I started brainstorming. Inspired by state logo items I have seen on Pinterest, I thought I would make ornaments with the gift recipient’s home state and home town in a little heart. For my folks and in-laws, I made ornaments showing the state and town (or country and town) where their children live. Trust me, parents always want stuff that makes them sentimental about their kids, even when their kids are all grown up. So here’s how to make these sweet little ornaments. 1. Browse the internet to find an outline of the state (or country) you are looking for. Resize it in Word so that it will fit your embroidery hoop and print it out. The best size is about 2 inches high. 2. Carefully trace the outline of the state or country onto the fabric. Go slow and if you make a mistake, feel free to erase and start again, it won’t be noticeable if you use a light hand to trace. 3. Identify the town you want to use on a map and draw a little heart in that vicinity. 4. Choose your embroidery floss color and embroider the outline of the state and fill in the heart. I used a simple back-stitch. I choose orange for the Tennessee Volunteers, which my relative roots for. 5. Tie off the thread at the back and cut off any excess. Then cut around the embroidery hoop to trim off the excess fabric. Be careful not to get too close to the edge of the hoop so it does not slip out. It doesn’t have to be perfect, it’s handmade. 6. Cut a 4-5 inch piece of twine and knot it around the clamp to secure it. Then make a loop and tie the loop at the top, cutting off excess ends. 7. Enjoy your awesome new ornament and wrap it up nicely for it’s recipient!